On Tuesday night, the United Kingdom’s Prime Minister, David Cameron, will go to sleep secure in the knowledge that his government’s Windows XP PCs won’t be hacked the next day. That doesn’t mean you will. But that still provides an out to those who can’t facilitate a change. According to one report, for example, over 400,000 ATMs were running Windows XP earlier this year, owned by a variety of banks who no doubt can afford to pay for a support extension. 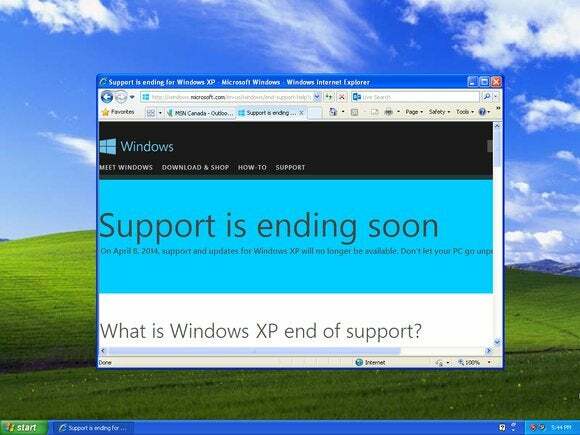 In March, a month before the deadline, 27.7 percent of all PCs tracked by NetApplications ran Windows XP. And, to be specific,”there is not a consumer equivalent” of Custom Support, Microsoft confirmed. For some, there’s the cost aspect: To run any Windows OS after Windows XP (ideally, Windows 7 or Windows 8), users will basically need to invest in a new PC, minus the monitor and printer. Given the relatively low cost of PCs, however, users can buy a new PC for a few hundred dollars. If you run Windows XP, let us know what you’d be willing to pay in the comments below. Chances are you’re out of luck, but if Microsoft is willing to maintain a database of patches for big business, maybe they’ll throw a bone to the consumer procrastinators, too.